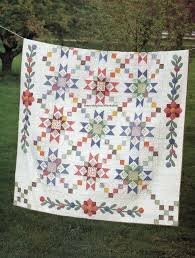 This quilt is a scrappy, but you can use the same fabrics for all blocks if you prefer. It's your quilt, make it your way. A hand will be gave at the time of registation. Sewing machine in good working order (preferably with a 1/4" foot and manual Rotary cutter & mat (no bigger than 12"x18") Rulers: 6"x12" and 6 1/2" square Basic sewing supplies (scissors, pins,thread, seam ripper and any special sewing tools you use.